Patent Pending are the band that Bowling For Soup have chosen to help them say goodbye to the UK on their farewell tour. Sad news about BFS, but great news about Patent Pending who we can’t get enough of. It feels like just yesterday we were buying their debut single and trying to find somewhere in the UK to buy tartan pants to fit our 14-year-old butts. Flecking favourites Bowling For Soup are about to become the band you can wave goodbye to in the UK. Check out this hilarious video from Jarinus. Ryan Hamilton is not a new face on the music scene, but he is one you can expect to see a whole lot more of. We’re currently obsessed with People On Vacation – everything from their music to the hilarious ‘Actual Conversations’ they share on YouTube. The fantastic People On Vacation have a new album on the way, and you can pre-order it (with perks) now. 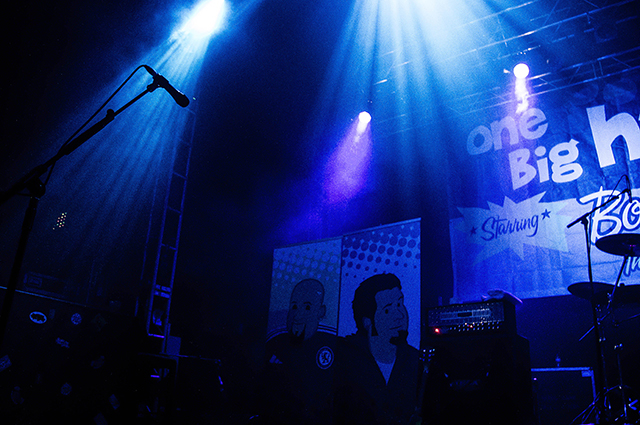 The One Big Happy Tour is exactly that – the bands are happy, the music is happy and the fans are happy. Leave your skinny jeans and your side-swept fringes at the door, emo kids. The One Big Happy Tour is a start-to-finish fun-fest, and we loved every second of it. Flecking favourites, People On Vacation, have recorded an epic cover of a Demi Lovato song. Our new favourite band People On Vacation have a new video for you to check out. This month, half of Flecking favourites Bowling For Soup are visiting our shores for one of their legendary acoustic tours.